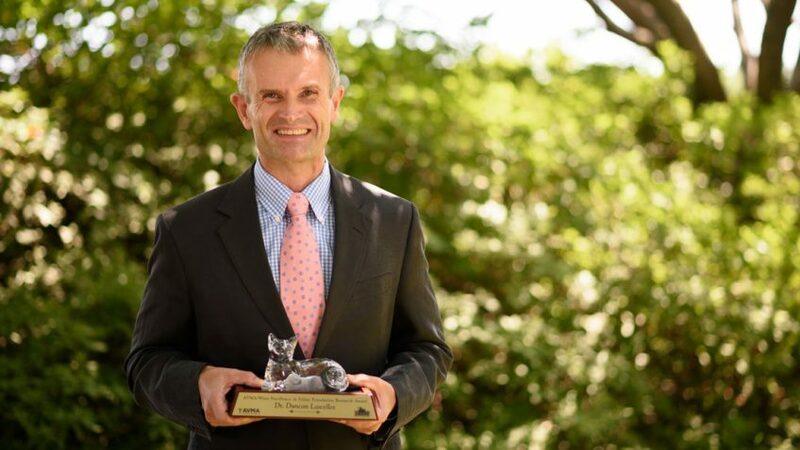 Duncan X. Lascelles, professor of small animal surgery and pain management and director of the comparative pain research and education program at the NC State College of Veterinary Medicine, is the recipient of the 2017 American Veterinary Medical Foundation/Winn Feline Foundation Excellence in Feline Research Award. Established in 2009 by the American Veterinary Medical Foundation and Winn Feline Foundation, this award honors a candidate’s contribution to advancing feline health through research. Of Lascelles’ more than 150 peer reviewed scientific reports, over one third have been dedicated to pain recognition or pain management in the cat, as have an additional seven book chapters, and 64 scientific abstracts, all focused on pain recognition or pain management in the cat. His clinically-relevant research and passion for disseminating the new information this creates has resulted in an increased recognition of how pain is diagnosed in the cat, how pain can be alleviated and reduced through early recognition, and how pain can be managed more thoughtfully and safely for cats with chronic disease. 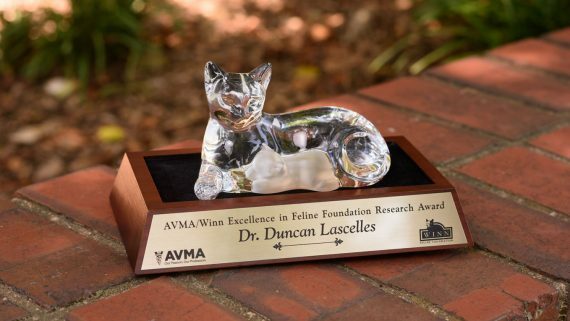 Winn Foundation board chair Dr. Shila Nordone presented Lascelles with a special crystal cat award symbolic of the honor, dubbed the “Winnie” award, during a visit to the CVM campus on Thursday, August 10. She acknowledged Lascelles as “a trailblazer” in the quest to be able to measure and quantify pain in companion animals. She pointed out that owners are not only interested in the longevity of their pets, but in their “quality of life,” and Lascelles’ work gets to the heart of that concern. She added that the ability to actually numerically measure pain is the “holy grail” of research in that area. The Winn Feline Foundation was instrumental in funding groundbreaking research done by Lascelles in the identification of specific biomarkers in cats indicative of pain, including levels of pain and the biological source of pain. The Winn Feline Foundation is the only nonprofit organization focused exclusively on feline health. Since 1968, Winn Feline Foundation has funded more than $6 million in health research for cats at more than 30 partner institutions worldwide.